Robin Williams has sunk his teeth into yet another role where he can improvise and chew up the scenery. What you end up with is another mishmash of the same dribble you’ve come to expect in the romantic comedy category. Hey, I may be a dude, but I enjoy a good poke at relationships and dating. If it weren’t for these sappy movies I’m sure three quarters of the population wouldn’t have a reason to meet in the first place. So, here we go: Robin Williams has got that seventeen-year-old spirit that just can’t be duplicated. Unless he’s absolutely high on cocaine; but he’s cut that out of his diet since the early 90’s. 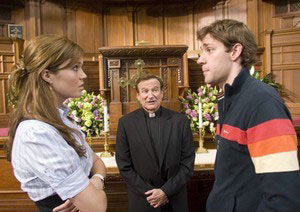 Williams can easily steal the show if he’s not kept in line, and can turn a great movie into a mediocre one: which is what happened with License to Wed.
Jim announces his affair with Pam the secretary at the wrong time. The movie is about two lovebirds who were destined for each other (Ben and Sadie) played by John Krasinski and Mandy Moore. 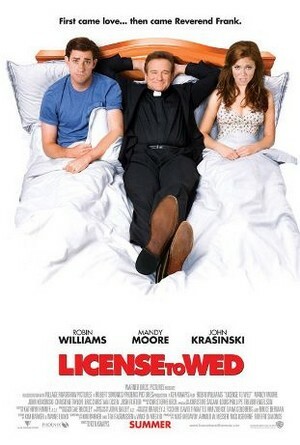 After some courtship, the pair decide to get married, but there are some stipulations; namely they get hitched at the same church as the bride’s parents, and that they pass a martial readiness course run by family friend Reverend Frank (Williams). Trying to pass the marriage course is frustrating especially to Ben, as Frank tries at every opportunity to showcase Ben’s inadequacies by forcing word association games with in-laws, plants an audio bug in the couple’s bedroom, and is outwardly creepy and endangering all around. Especially that bedroom bug: seriously – wouldn’t you just bring the guy to court and get hitched in Vegas instead? Of course, all the horrible things that Frank does are all justified by Sadie’s family. Does this mean they’ve all had to endure the humiliation of carrying around robotic babies that produce excrement, cry and look incredibly terrifying? What’s even worse, the filmmakers try to see things from Sadie’s point of view, how could we take her side in Franks escapades? Really, Sadie just comes off as stupid and insecure. If you fell in love with a guy, why would religion make you change your mind? Besides this and I mean the MAIN PLOT, the movie is tolerable. 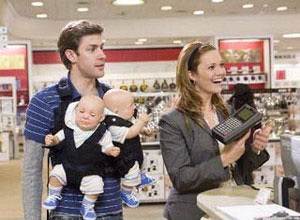 My fun was had in seeing Office Star John Krasinski’s co-workers show up in similar roles throughout the movie. It shouldn’t be a surprise, director Ken Kwapis did direct the original US pilot for the show, so some co-stars had to sneak in. The laughs come off as painful, and the script could use a little more fine tuning – it shows that the producers figured they could hinge the whole picture on Williams’ name alone. His character pushes too hard, controls his subjects and has a shady past himself when he’s a man of the cloth. So, why listen to this guy? He’s not even credible. The best part of the whole film is when Ben punches the reverend for interfering so much: finally! A movie that puts the wants of the public back in! But its short lived and it ends… well, it’s a Rom/Com – how do you think it ends? The funny misses due to an overly possessive Robin Williams, all the other characters are as stock as soup cans and the plot is predictable. It’s not great, and there are other flicks that do more with less.